Then he told me that he is planning to make one of Trinka’s recipes: Banana Oatmeal Chocolate Chip Cookies. Last spring I gave him one of our church cookbooks. He must have been reading through it last night. Church cookbooks (or Junior achievement cookbooks or Women’s club cookbooks) are a gathering of favorite recipes by the members of an organization. Our cookbook is a treasure not only because of the wonderful, ordinary, simple recipes, but also because they are the favorite recipes of people that Will has grown up with. Now that he is living away from home, it is nice to have that connection with his home church. Last night he made one of the recipes I contributed: Grandma’s Waffle Recipe. My mother is one of those cooks who throws ingredients together without measuring anything. This method of cooking has resulted in some spectacular failures, but the great majority of the time, her cooking is highly praised. My mother always made wonderful pancakes and waffles, so over the years I repeatedly begged her for the recipe. She would say, “I don’t have a recipe. I just throw everything together.” Finally, during one of the times she was staying at my house, I said, “Let’s measure everything as you mix your pancake recipe. That way, everyone in the family can have this recipe.” So we measured at every step, and I wrote it down. I never feel bad about serving this recipe because, for pancakes or waffles, it has a lot of protein. 5 cups flour; 1/2 cup sugar; 4 heaped plastic teaspoons baking powder; 2 level teaspoons salt (sparse); 4 cups milk; 1/4 cup oil; 3 large eggs. Mix together until roughly smooth (add a little milk if it is too thick. Stir in.) Use in waffle iron or cook as pancakes. This recipe is very easy to cut in half. (Use two eggs). This recipe makes a lot of pancakes; so if we have any batter left over, I put in the fridge for pancakes the next day. P.S. 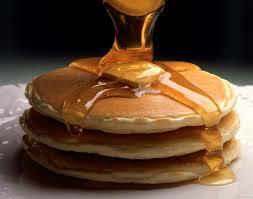 – As I am mixing the pancakes up, I am realizing that I left out a few important instructions. 1) You need two bowls. Mix the dry ingredients together in large bowl, and the wet ingredients together in another bowl (put the eggs in first and whip them lightly with a fork. Then add oil, mix, then the milk). Then make a well or cone shape in the dry ingredient bowl, and add the wet ingredients, and mix until mostly smooth. When cooking pancakes, you need a flat pan…I use a large flat frying pan, although if you have just a frying pan, you could cook one at a time. My mother used a griddle. Grease the pan with margarine, shortening, or bacon fat. I am going to use margarine tonight. Turn the heat on medium low. 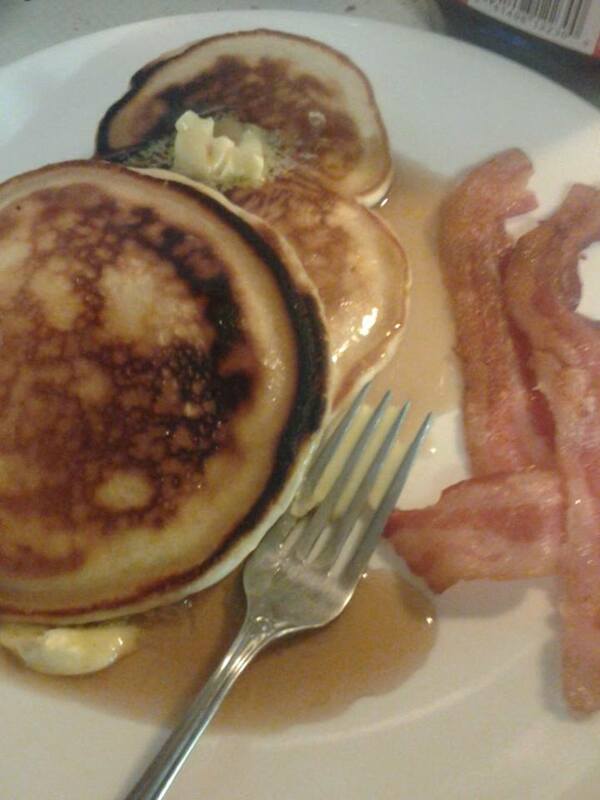 After the pan is greased, then ladle about half a cup of batter where you want each pancake. (As you can tell, words fail me in these instructions). Spread the batter a bit with your ladle so that it is flattened out a bit. Let the pancakes cook until you see bubbles on the top it is not as shiny. Then flip the pancake to the other side. Check underneath with your spatula to see if they are brown. Then flip quickly with your spatula. Then cook until the pancake is lightly brown on the other side. 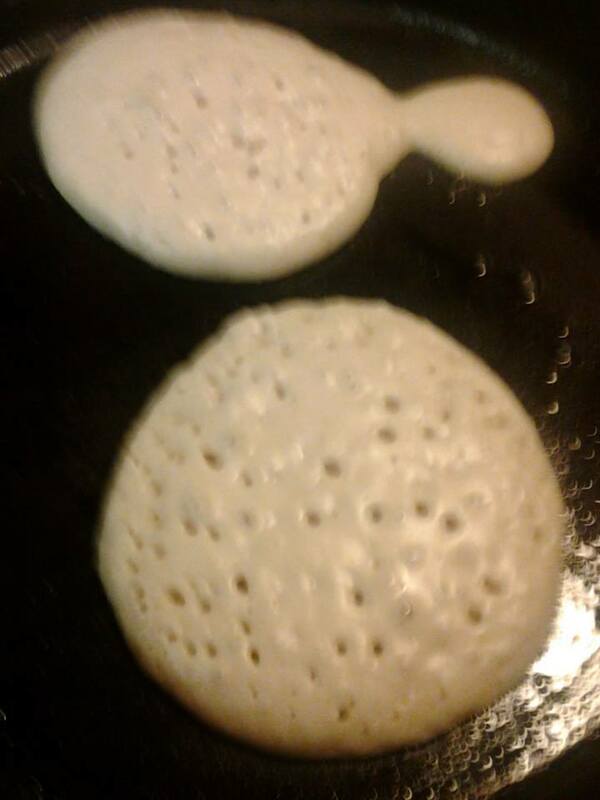 I always peak under the pancake with my spatula. And here is the sweet reward. Will has learned to cook from both Ralph and me. Ralph is more of a “throw it together” kind of cook. I still follow the recipe. Learning to cook was one of the skills we intentionally taught our kids as we prepared them for independence. I love pancakes! They are seriously one of my favorite foods. I’ll be trying this recipe. Thank you for passing it along. You are welcome. They were delicious. Suddenly I have a craving. Yum. Hope you made some pancakes, or had some. Nothing better when fall is in the air.